The Holiday 2017 Bookfair continues online thru December 21st! A big thank you to all who came out to support the library on December 16—we had a record-breaking day! 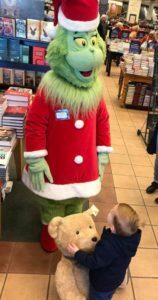 A special thank you to the amazing staff of Barnes & Noble Fairfax, Lisa Maxwell, 123 Andrés, Dream Face Balloon Art and the Grinch for making the day so special! To support the Bookfair and give back to your library online, visit www.BN.com/bookfair. Do your shopping as usual, and then on Payment Page, scroll to the bottom and select “Check this box if it is a Bookfair order.” Finally, add our code: 12128419. Note: If customers are signed in to an existing account, from the Checkout screen they should click on the Change button in the Payment section to get the full payment screen and the bookfair ID field. December 16 Holiday Bookfair was a big success! 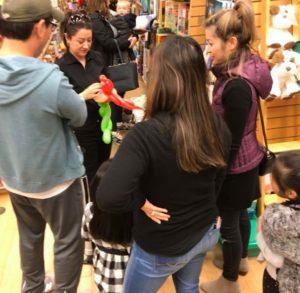 Our Bookfair at Barnes & Noble Fairfax on December 16, 2017 was a big success, with record-breaking participation from library supporters! 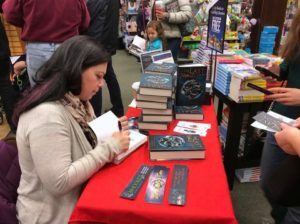 We were the largest Bookfair at B&N Fairfax this year (and in recent memory). That means we raised more funds & friends than ever before for the library! 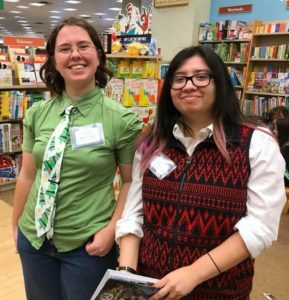 We send out a great big thank you to our special guests, volunteers, and the stellar staff of Barnes & Noble Fairfax who made the day so wonderful. 123 Andrés performed a fantastic, interactive show in the music department, New York Times best-selling author Lisa Maxwell signed her books and talked writing, there was a talented balloon artist, kids made bookmarks all day, and the one and only Grinch stopped by to greet guests! The Grinch meets a fan. 11am-5pm – Holiday shopping and free activities for kids all day! 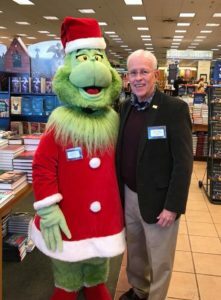 TBA Surprise – Visits from the Grinch! 5pm – End of Bookfair, but shopping continues all day in store and December 16 – 21 online! 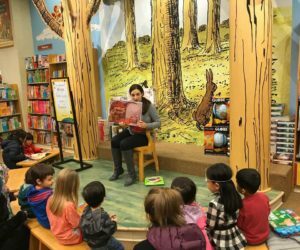 Show Your Support: Use the Foundation’s special code (12128419) in-store on December or online December 16-21 and Barnes & Noble will donate 10% of your purchase to support Fairfax County Public Library. Stop by between 1 – 2 pm to meet Lisa Maxwell, local author of Young Adult books. She’ll be signing books and chatting with shoppers! Lisa Maxwell is the New York Times Best-Selling author of The Last Magician. The book is being translated into six languages and has been sold in eight territories. Her other books include the award-winning Unhooked, as well as the critically acclaimed Sweet Unrest and Gathering Deep. She has a PhD in English and currently is a professor at a community college outside of D.C. She has a soft spot for loud music and fast cars, so when she’s not teaching or writing, you can probably find her catching a live band or going on adventures with her husband and two boys in the Challenger she named Viola. 123 Andrés is one of the area’s most popular performers for children and Latin Grammy winner! You don’t want to miss his performance at 2pm! Andrés Salguero, better known as 123 Andrés, is one of the most exciting new voices on the family music scene in the US and Latin America. 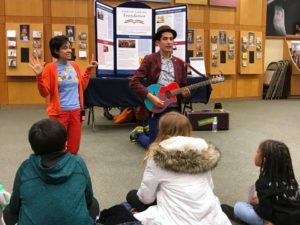 A native of Bogotá, Colombia, Andrés brings to audiences joyful sounds, passion for bilingualism and a high-energy love of music that gets kids singing and dancing in Spanish and English. Dream Face Art will be back again, creating whimsical balloon creatures, by request, in the Children’s Department. This was a huge hit last Bookfair, so we’re thrilled to have this artist back again! 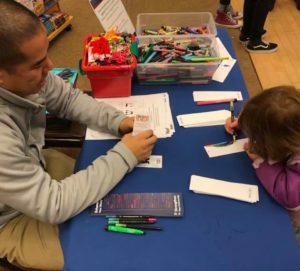 On April 30th, 2016, Fairfax Library Foundation held its inaugural Bookfair Fundraiser at Barnes & Noble Fairfax, in order to raise support for Fairfax County Public Library. The Foundation is grateful for all the library supporters, special guests, volunteers and Barnes & Noble staff for making this event a huge success. You can read a wrap-up of the event here. We’ll be back for another Bookfair in the fall! For more information about hours and events at the Fairfax Barnes & Noble, please click here.